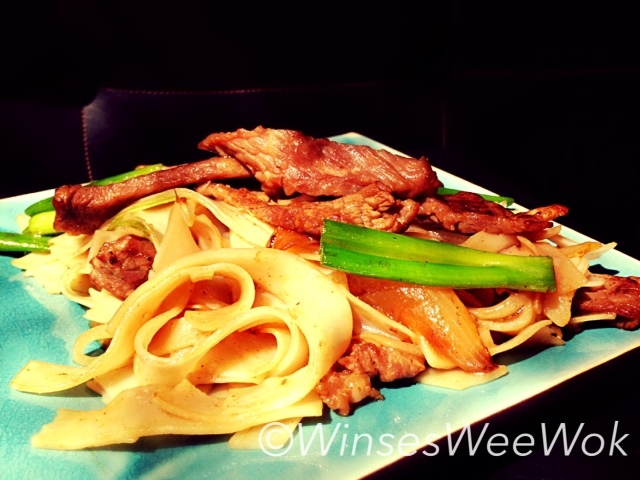 Dry fry beef noodles (hor fun) is a popular Cantonese dish, made from stir-frying beef with wide rice noodles. Found in all yum cha restaurants and café stalls. The secret in making of this dish is as the Chinese says “wok hey” which means the heat of the wok. The cooking must be done over the highest flame and the stir frying must be done quickly. The noodles (hor fun) is quite delicate and must be stirred quickly and carefully to prevent the noodle strains from falling apart. This dish is a favourite of my friend Vong! I remember I made two mixing bowls worth of beef hor fun one Saturday afternoon. The 4 Lads came back from a night out hungry. Between the four of them, 3 polished off one of the mixing bowl but Vong decided to take it upon himself and finished one whole mixing bowl of noodles. I don’t know where he puts it. The next day he told me that was one of the best beef hor fun he has ever had. Not quite sure to believe him and then I looked at the empty bowl. Well, as they say actions speaks louder than words. Thanks Vong! • Place the dried noodles into a large pot, pour hot boiling kettle water and submerge the noodles, cover with a lid and leave it to soak and soften for 6 minutes. After soaking/softening the noodles, drain into a colander and rinse under cold running water, drain and set aside. • Into a bowl, combine all the sauce ingredients. 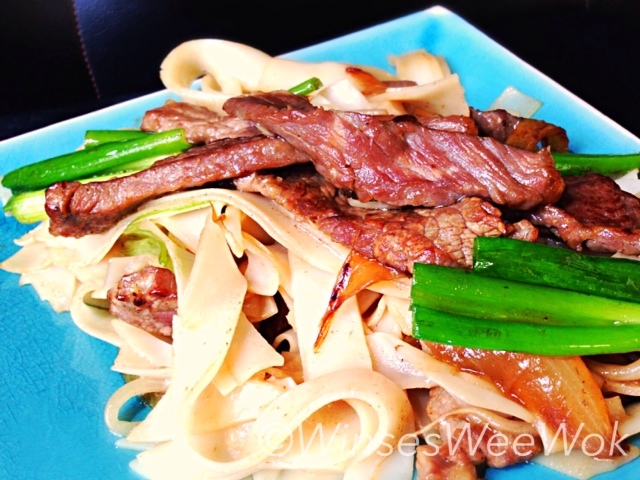 • Slice the beef into thin strips, add in the tenderising beef ingredients. Mix well and set aside for 5 minutes. Rinse under cold running water to rid of all the bicarbonate soda, set aside. • Wash, drain the bean sprouts, cut spring onions into 2 inches in length, slice an onion and set aside. • Add a tablespoon of oil to a hot wok, set at high heat setting. Add noodles and stir fry gently for 1 minute. Remove from the wok. • Add the remaining tablespoons of oil into the wok, stir fry the onions for 2 minutes, add in beef strips and stir fry for a further 2 minutes. • Add bean sprouts and stir fry for 10 seconds then add in the sauce. Bubble the sauce for 1 minute before adding the noodles back into the wok. Add spring onion, toss and serve.